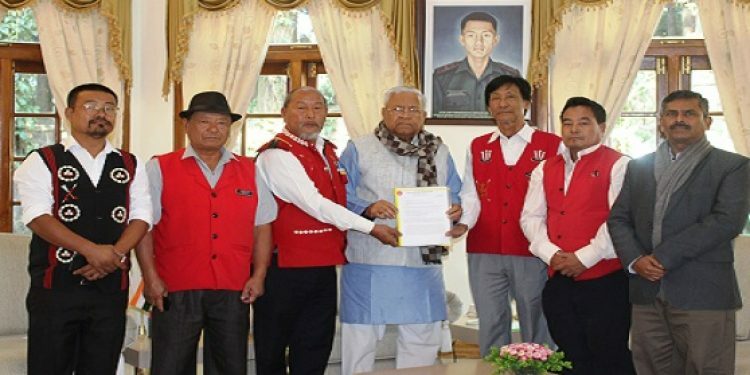 The Nagaland Gaon Burha Federation (NGBF) on Wednesday decided to take out a march to the Raj Bhavan for submitting a memorandum to President Ram Nath Kovind through the State Governor with a request not to give his assent to the Citizenship Amendment Bill (CAB), 2016 if it is passed in Rajya Sabha. The controversial Bill, which was passed in Lok Sabha on January 8, 2019, despite massive protests across the Northeast, is yet to get Rajya Sabha nod. The march will be started from Old MLA junction and reach Raj Bhavan in Kohima. The Federation of village heads took the decision to hold the march, named Kohima March, at a consultative meeting on Naga political issue vis-a-vis Article 371 (A), Bengal Eastern Frontier Regulation, 1873 and Inner Line Permit here with apex civil society organisations of Nagaland. The meeting was attended among others by Ex-Parliamentarians Forum Nagaland, Joint Committee on Prevention of Illegal Immigrants, Eastern Nagaland Public Organisation, Naga Hoho, Nagaland Tribes Council, Central Nagaland Tribes Council, Christian Forum, Forum for Naga Reconciliation, Naga Students Federation, Eastern Nagaland Students Federation, Angami Public Organisation, Chakhesang Public Organisation, Ao Senden, Lotha Hoho, Sumi Hoho, Naga Mothers Association, etc. The NGBF rubbished the Nagaland government’s contention that Article 371 (A) provided the shield of protection to Nagaland and Nagas wherein it was stated that “no Act of parliament shall apply to the State of Nagaland unless the Legislative Assembly of Nagaland by a resolution so decides”. It termed this as a “feeble argument and a dangerous one”. Quoting relevant portions of Article 371(A), the federation asked the State government how could it be so assured that the Article would protect the Nagas in the event of Bill becoming an Act. It said there is no mention of citizenship in the Article while stating that the hope of taking 371 (A) as ammunition to oppose the Bill when it becomes an Act would not pass the legal scrutiny in time. Extending its support to the proposed march, the Joint Committee on Prevention of Illegal Immigrants (JCPI) requested all major Naga tribes in Dimapur that include Ao, Angami, Chakhesang, Lotha and Sema to send 15 representatives each to partake in the march. It requested the other remaining tribes to send 10 representative each. The JCPI asked the presidents of all tribal bodies under Naga Council Dimapur to submit the names of their representatives to the Naga Council office on Thursday.